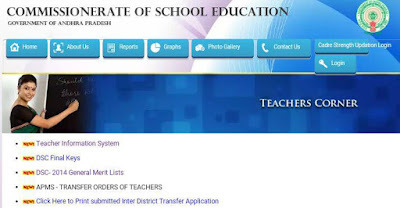 AP Teacher Information System DATA Entry Procedure, Teachers Details Upload Step by Step Instructions, Educational Information, Transfer Details, Promotion information, How to Upload teachers Information and More Details Enter in School Education Official website http://cse.ap.gov.in/. To update teacher database with correct information of all Teachers. This details will help Teachers while applying for transfers, promotions, awards, No objection certificate for Traveling abroad, claiming Medical Reimbursement etc. An application is developed and given to each Teacher to fill in their details. The facility is given to the Teacher himself/ herself to avoid any discrepancies. The data entered by the teacher will be taken as final details. How to fill in the details ? 7. Click on Different Types of Details to Enter your Details. SIR HOW TO ENTER GAZZITE NUMBER WE HAVE SERIAL NO. AND PAGE NO. Sir, I didn't take copy print before final submit. How to get the print out now? Sir my Treasury ID number was wrongly sent... nwo I cant access my account can u help me with that? All options Completed, After Final Sunmission button Open. I have couple of problems regarding Teacher Information System. 1) All my transfer details got jumbled and saved in out of order manner. 2) Even though i added my B.Ed details, it's not showing up in my details. I submitted my details, and now i can't edit them, to add the B.Ed details. I would really appreciate if you could help me with some kind of guideline. DONT WORRY ITS ALREADY SAVED BUT NOT REFLECTING IN THE PRINT YOU CAN SUBMIT THE PRINTOUT WITHOUT HESITATION. I filled my father's details correctly.. But in the promotion it is not showing correctly.. My final submission also over...how can I correct it??? B. Ed data are wrongly entered. I can't edit it. What can I do? B. Ed data are wrongly entered. How can I erase it.